What a difference five years makes. June 29, 2007 saw the debut of Apple's iconic iPhone, six months after its initial unveil during one of the company's most classic keynotes ever. At the time, names like Nokia, Palm and Research in Motion were the top dogs of the smartphone industry, and the term Android was relegated exclusively to science-fiction. Critics were quick to dismiss Apple as a viable smartphone maker, despite Steve Jobs' impressive demonstration of the handset at the January 2007 Macworld Expo keynote. However, the faithful showed up in droves five years ago to be the first to buy one, and Apple hasn't looked back since. The original 4GB and 8GB iPhone featured an aluminum back with a black plastic strip across the bottom to support the various radios inside, with its glass face surrounded on all sides by a rounded silver band. A year later, the iPhone 3G would introduce a sleeker all-plastic frame, now available in black or white in 8GB or 16GB capacities, finally tapping into AT&T's burgeoning 3G data network. Come June 19, 2009, the iPhone 3GS kept the same exterior, again beefing up the storage (up to 32GB) while improving the camera, adding video recording and a faster processor. By the following year, the iPhone 4 make a clean break from the original design with glass on both sides and a stainless steel band holding it all together; it was a quantum leap forward, with 720p HD video recording, LED flash and three-axis gyroscope. Coming out of the previous model's "Antennagate" unscathed, Apple went on to introduce its best model yet, the iPhone 4S, shifting their release schedule into the fall with an October 14, 2011. Initially dismissed as externally the same as the iPhone 4, the current model vastly improved the camera and video recording, tapping into faster HSDPA data speeds and introducing the world to Siri, the company's virtual assistant software. 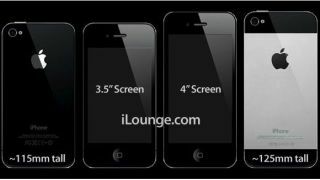 So what can fans expect from the iPhone 5? No one knows for sure, but pundits anticipate a slightly taller device to allow the screen size to increase from 3.5 inches to 4.0 inches, a new, smaller dock connector and the headphone jack moving from top to bottom -- the first significant change since the iPhone 3G ditched the recessed jack on the original model. Over the course of five years, Apple shipped a whopping 250 million iPhones, ringing up cash registers to the tune of $150 million in cumulative revenue for the company and its carriers. Needless to say, that's been at the expense of Nokia, RIM and the late Palm, who apparently turned a blind eye to the iPhone's ascension.